Lately, my style has been running less towards bright, poppy colors and more toward a vintage sensibility – browns, kraft, muted colors and non-shiny metallics. This is inspired by two things: one, the changing colors and the crisp air in New England, where I live, and two, the Instagram feed and website of Eunice Roe. Recently, she did a blog post on her favorite writing instruments. Now, if you know anything about me (or if you don’t), I am a great lover of beautiful pens, and it’s always been my quest to find pens that are gorgeous and take the super-fine-point refills of the pens I love to write with, pens which are normally cheap-looking, plastic-bodied pieces from Japan. 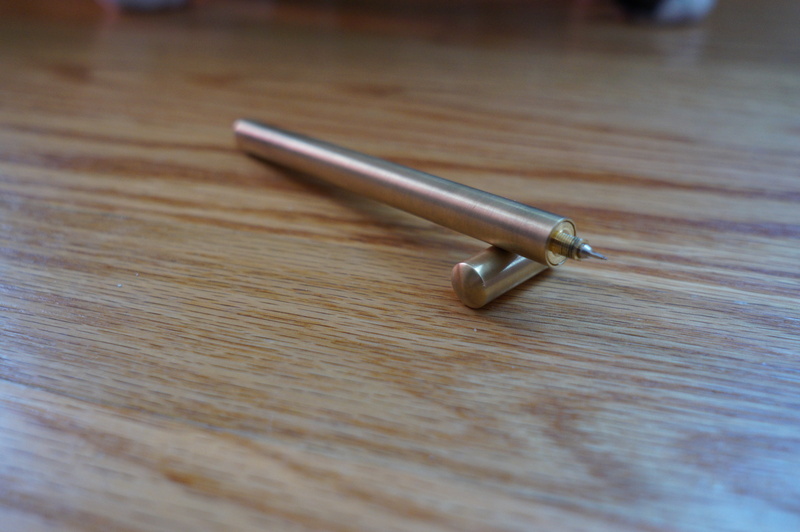 Imagine my joy, then, when I saw this: the brass pen from ATELEIA. This pen holds refills from some of my favorite plastic pens, which allows me to make the very fine (0.3 mm) lines I like AND do it using a beautiful, conversation-starting piece of craftsmanship. There are two cons and one thing that’s not a con but is slightly annoying. The cap is a screw-off cap and cannot be posted. Not a deal-breaker for me, but for some it might be. It makes your hands smell metallic when your body heat/oils/whatever react with the surface of the metal. Again, not a deal-breaker, but something to be aware of. You need a flat-planed tool – I use an adjustable wrench – to change out the refills. You need to grip the flat sides of the nib housing and unscrew the body of the pen; you can’t do it with just your fingers and you REALLY shouldn’t use a pair of pliers because you’ll damage the metal. Not really a big deal unless you’re changing refills all the time, but definitely something you should know if you plan to put your own refill in rather than use the one it comes with (which for me was a Pilot Hi-Tec-C in 0.5). It’s also worth noting that there is no clip on this pen; it’s cylindrical, which means (a) it’s a roller, so (b) you should probably get a sleeve to protect it and keep it in one place when it’s not in your hand. I happened to have a leather pen sleeve but ATELEIA sells them if you don’t. This brass pen is fantastic for fall (and all the time), and I’m looking forward to many, many years of enjoyment. It’s definitely helping me make my notes for my current WIP, Siren: Bride of the Broken King, look super cool!